Kolkata couldn't intake the poison spewed by Rashid Khan's mysteries. Kane Williamson is renowned to employ a calm and collected approach. 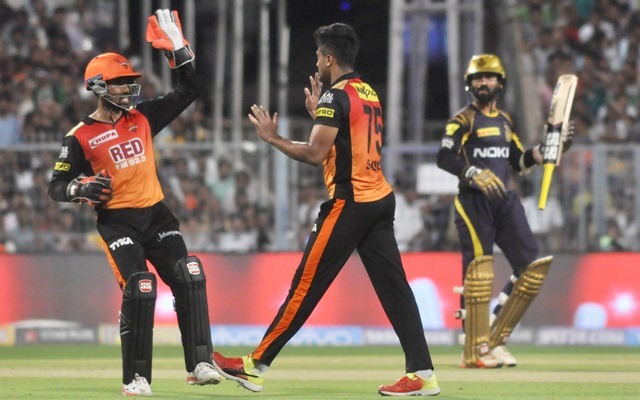 Albeit he sported an unflustered outlook during the toss, the panic button had well and truly been pressed by the Sunrisers Hyderabad prior to their contest versus the Kolkata Knight Riders at the iconic Eden Gardens in Kolkata. The franchise resorted to as many as three changes to their playing eleven. They handed Khaleel Ahmed, the left-arm seamer his maiden IPL cap. They ran out of patience with Manish Pandey and replaced him with Deepak Hooda. Wriddhiman Saha’s inclusion could only have been justified by the fact that he knew the venue by the back of his hand. Sandeep Sharma’s exclusion was understandable for the reason that he seemed lacklustre in the last few matches. On the contrary, the Men in Gold and Purple looked a settled lot. They didn’t need to make any changes as they came into the match on the back of four consecutive victories. The match turned out to be a roller coaster ride as both teams had their fair share of opportunities. However, SRH turned out victorious on the day by 13 runs and made their way into the Final against the Chennai Super Kings on Sunday. Dinesh Karthik won the toss and elected to field that didn’t come as a surprise. Saha and Shikhar Dhawan commenced the proceedings and the duo took their side off to a handsome start with a partnership of 56 runs. Dhawan threatened to accelerate the scoring rate, but Kuldeep Yadav trapped him in front of the stumps for 34 runs to give KKR their first breakthrough. The chinaman wasn’t finished as he nipped out the prized scalp of Williamson in the same over with a ripper of a wrong’un. Saha looked good for a substantial score, but his progress was halted by Piyush Chawla, assisted by some sharp piece of stumping by Dinesh Karthik. Shakib Al Hasan succumbed to an unlucky run-out. Deepak Hooda smacked the ball and it ricocheted off Kuldeep’s hand on to the stumps. Hooda strained to find the boundaries and eventually tried to break the shackles against Sunil Narine in the 17th over. The right-hander played a reverse-sweep only to find the hands of Chawla at backward point. Carlos Braithwaite and Yusuf Pathan couldn’t make any impact. After 18.1 overs, SRH were reeling at 138/7 and seemed to fall way short of what they would have liked to score initially. It eventually required a cameo from Rashid Khan to drag SRH out of the pits. The Afghanistan batsman flung his willow and muscled his way to 34 runs from 10 deliveries. He whacked four sixes and a couple of boundaries. The onslaught propelled the Orange Army’s score to 174. The last over by Prasidh Krishna went for 24 runs as Rashid laid into the youngster with some lusty blows. The target was a stiff one for the Knights bearing in mind the significance of the encounter. The onus was on Chris Lynn and Sunil Narine to get them off to a blistering start. The duo raced away and amassed a stand of 40 runs from 19 balls. The Windies batsman smacked Bhuvneshwar Kumar for 19 runs in the second over to bring the target down significantly. Siddarth Kaul dismissed him in the fourth over to bring sanity into the proceedings. Nitish Rana and Lynn carried on with the good work and compiled 47 runs together. Lynn, at the other end, looked at his ferocious best. The boundaries flowed off his bat and SRH looked somewhat rattled. Rana’s wicket was the second to fall as a clean throw by Rashid accounted for his wicket. Rashid was introduced into the attack in the seventh over and he changed the complexion of the game. In the very next over, Robin Uthappa attempted an audacious reverse-sweep from Rashid only to see his stumps shattered. Shakib delivered a body blow in the next over with the wicket of Karthik. The ball turned sharply and cannoned into the stumps. Lynn survived a scare of Rashid early on, but couldn’t protect himself in the 13th over. Andre Russell was required to play a knock of substance, however, he became Rashid’s third victim. Dhawan took a sharp reflex catch in the slips to send him packing. From 87/1, KKR slumped to 118/6 in a space of 37 balls. In the last five overs, they needed 57 runs. Shubman Gill and Piyush Chawla were required to pull off a herculean task to bring the Knights back into contention. In the 16th over, they notched 10 runs off Khaleel Ahmed. Kaul bowled a brilliant 17th over followed by another brilliant over from Bhuvneshwar. With 25 runs required from the last seven balls, and that is when Gill drilled Kaul downtown for a thumping six. The shot brought the target down to 19 runs in the last over. The responsibility was on Carlos Braithwaite to defend 19 runs for SRH. He started the over poorly as Shivam Mavi carved him over the point region. Nevertheless, he got rid of both Mavi and Gill off consecutive deliveries to bring the curtains down for the KKR. Rashid contributed on the field as well with three catches and a brilliant run-out to add to his magical spell of 3/19.